As we predicted in a recent post, Santa Ana water rates are going up again. The City of Santa Ana mailed letters to local residents this week regarding the increase. Click here to read the letter. They are holding a public hearing on June 7, at 6 pm, at the Santa Ana City Council Chambers, to allow us to comment. They claim the increase is to repair, maintain and replace water and sewer infrastructure. My sources say this is a lie. They are shifting money from the water budget to the general fund. And the mains they are damaging are being damaged due to water pressure changes brought on by the fact that the City is relying on computers to maintain water pressure, instead of trained operators. Don’t buy this spin! Contact your Council Member today and let them know you are opposed to the new increase in our water rates. 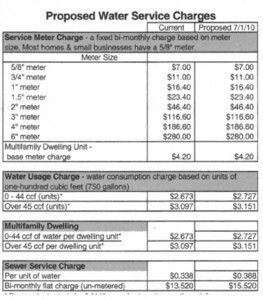 We already pay more for water than almost every other city in Orange County, including Irvine!